I opened my mailbox to a wonderful surprise yesterday! I received my Influenster Darling VoxBox! I was so excited to open it. I had not peeked online to see what I was receiving so I was anxious to open this package up. I was so surprised! All of these items were in my Darling VoxBox were complimentary and were sent to me for free for me to review and give my honest opinion. I don't have a baby but I do have an 8-year old who is my baby. I used the live clean shampoo & wash and the lotion on him. We loved it! He was excited to use a body wash and shampoo that didn't sting his eyes. I used the Vichy Mineral face moisturizer last night and this morning and loved it! You have to massage it really good into your face. After it dries up, it leaves your face feeling great and smooth. I'm rubbing my face as I type (for real I am). My daughter and I have been on a health kick. Combined we have lost a total of over 70 pounds. We saw the energy Gummies from Nature made and our eyes literally looked like this 😍. We popped two of those kola nut gummies after dinner and began our workout. They didn't smell good but they tasted great! We look at the Duncan Hines Chocolate Lover cake. My diet is a low carb so I won't be eating it. My daughter will be fighting with my son over it. That will be eaten tonight. I'm pretty sure it is going to be amazing and tasty! The Eva NYC hair mask was amazing! I wasted no time using this. I went online and ordered some more. We need to take care of our hair! Go and buy this! You will not be disappointed! My hair feels and smells wonderful! 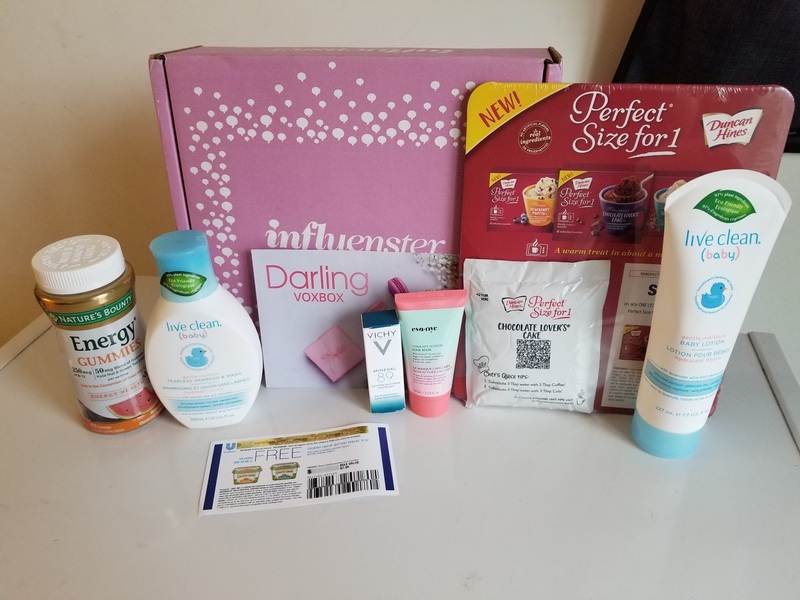 This has got to be one of the best boxes I have ever received from Influenster. Good job guys!